The austerity of a prison cell can be, ironically, a safe haven for an Israeli man who is refusing to grant his wife a get (Jewish divorce). Whereas the law permits a rabbinical court to punish a recalcitrant husband by revoking his drivers' license, taking his passport, closing his bank account or imprisoning him, there has been little leverage available to compel a man already serving a jail sentence to free his wife from the constraints of a failed marriage. According to Rachel Levmore, a 1995 graduate of OTS's Monica Dennis Goldberg Women's Advocate Program, there are many Israeli women who are stranded for years without a get while their husbands sit in prison. Levmore, 47, has dedicated herself to obtaining Jewish divorces for these women by advocating the enforcement of a recent amendment to the law which mandates stiff punishments - including the removal of personal belongings, cancellation of home leave and even solitary confinement - for the obstinate husbands. "I've found that many rabbinical court judges and prison officials didn't know what to do with this law," says Levmore, the first woman advocate to hold a position on the Directorate of the Jerusalem Rabbinical Court system. "Imagine how many women have despaired of receiving divorces because they felt they had no legal recourse!" Levmore regularly meets with rabbis and Prison Service officials to make sure they are doing their part in setting the wheels of Jewish justice in motion. And each month, she sorts through hundreds of unresolved cases in court records, to find the ones that might be expedited by the new law. Her tenacity has already helped 10 agunot - "chained women" -- obtain divorces after many years of waiting. 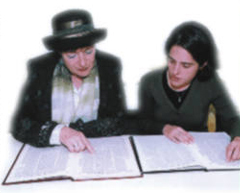 In the 12 years since Ohr Torah Stone opened the Monica Dennis Goldberg Women's Advocates program - the only program in the world that trains toanot - a dramatic transformation has taken place in the rabbinic courts. "Our first graduates had to overcome a tremendous amount of resistance and discrimination from the rabbinic establishment, which believed that only men could work as advocates," recalls Nurit Fried, director of the program. "But today, the rabbis view the toanot as a natural - and even integral - part of the court scene." In fact, statistics from OTS's Max Morrison Legal Aid Center and Hotline, staffed by women advocates devoted to attaining justice for agunot, show that 21% of the Center's clientele is referred by the rabbinical courts -- the very body that initially opposed the existence of toanot. The fact that the Legal Aid Center's brochures are now displayed in the courthouse also serves as clear testimony to the professionalism and dedication of the toanot. As a result of this revolution, rabbinical court advocacy has become a sought-after career choice for bright, highly-motivated young women. Avital Ribner, 22, finds that the curriculum in the Women's Advocate Program is a perfect complement to her studies toward a law degree at the Hebrew University. "I want to have every tool available to help my clients to the utmost," she explains. "Since my interests are in both family law and Jewish law, becoming a toenet was the natural choice for me." Besides receiving intensive education in halacha, the toanot are trained in counseling, mediation and negotiation. Further, stresses Fried, "the most important thing we teach our students is that we are not in this profession for money, fame or to help one spouse get revenge against the other. The goal of a toenet is to serve everyone's best interests." As a result, both men and women have turned to women advocates as an alternative to lawyers in divorce cases. "We felt our lawyers were making our divorce far more involved than it needed to be," remember David and Chana, who finally turned to a toenet after two years of legal wrangling. "It seemed they were deliberately raising issues that would spark animosity between us in order to prolong the process for their own benefit. Once we began working with a toenet, we were able to reach an amicable settlement within a few weeks. She represented us both equally and fairly, and helped us end our marriage with dignity." The toanot have been especially successful in aguna cases because of their advantage in communicating with their female clients. "I can hear in a woman's voice how much she has been physically and emotionally abused," says Levmore, a mother of seven. Levmore worked in private practice for five years before she was hired by Aguna Unit of the rabbinical court system to handle the most difficult cases of women who are unable to obtain a get. The position, funded by the Council of Young Israel Rabbis in Israel and the Jewish Agency for Israel, was created specifically with a woman advocate in mind. "My grandfather, Rabbi Mordechai Rosen, was the head of the rabbinical court in Vienna when he was murdered by the Nazis," Levmore muses. "I feel that I am continuing in his footsteps."